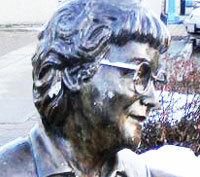 LOCATION: Bridget Moran statue, northwest corner, Third Avenue & Quebec Street, Prince George. Prince George-based social worker Bridget Moran consistently fought on behalf of the weak and underprivileged, producing several important biographies of Aboriginals. 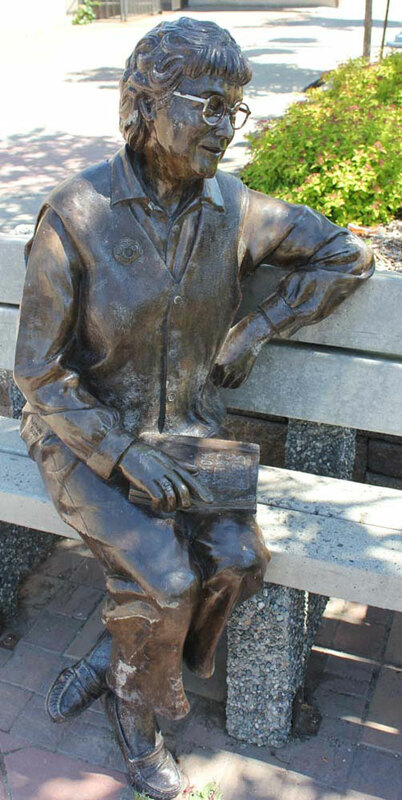 In 2003, the City of Prince George approved an initiative to erect a statue of her that was created by Nathan Scott of Living Stone Studio. It was erected in 2004. Bridget Moran Place is a retirement home for seniors at 590 Dominion Street in Prince George. There is also a low income housing development in Vancouver named in her honour. Bridget Moran, née Drugan, was born in Enniskillen, County Fermanagh, Northern Island on September 1, 1923. Shortly after her birth her family immigrated to Success, Saskatchewan, where they endured poverty. She taught school in rural Saskatchewan until she enlisted in the Women’s Royal Canadian Service in 1944. As a WREN she was assigned to Navy intelligence, mainly reading messages off the wire. Discharged from the Navy in 1946, she gained an Honours B.A. in Philosophy and English, graduating as a gold medalist at the University of Toronto. She began work on a Master’s Degree in History, but was unable to continue because the Department of Veterans’ Affairs would not support her because they found no women teaching in history departments in Canada. She came to B.C. and began her career as a social worker in November of 1951. 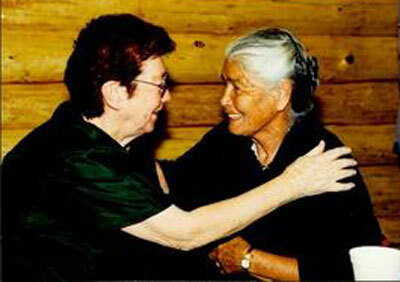 Bridget Moran began making visits to the Stoney Creek and Tachie reservations in 1954. She was suspended by the Social Credit government in 1964 for her public criticisms of welfare services as they pertained to children, including an open letter to W.A.C. Bennett. This letter was inspired by one of her clients, a troubled 13-year-old girl found drunk and nearly naked, who was sent to a reform school for lack of any alternate facilities. Moran and four other co-workers were suspended. She won reinstatement but was not able to work any more for government services. From 1977 until 1989 she worked as a social worker for the Prince George school district. Just prior to retiring from School District #57, Moran published her first book, Stoney Creek Woman (1988), about the life and times of Carrier elder Mary John. Born in 1913 near Prince George, Mary John became a mother of twelve, with seven children living, and had many grandchildren and great-grandchildren. Hers was a story of hardship, joy, poverty and intense grief. In 1920, as Mary Quaw, she was put on a wagon and shipped to Fort St. James’ residential school. She’d been born just seven years earlier to 13-year-old unwed mother. Forbidden to speak her own language, Mary John worked as a domestic in a white women’s houses until she had her first child at age 17 due to an arranged marriage. She remained married to her husband Lazare for 66 years. She was a hospital worker and Dakelh-language teacher. Her memoir Stoney Creek Woman, written with Bridget Moran, received the B.C. Historical Federation’s Lieutenant-Governor’s award and went through 13 printings. “After the book was published,” Moran recalled in a letter, “I went to several schools in the area and read various chapters to both elementary and high school students. To be honest, one could hear a pin drop as I read, and the questions were so relevant and caring.” Mary John was named Vanderhoof’s Citizen of the Year in 1979 and received the Order of Canada in 1997. Bridget Moran (1923-1999) sculpture by artist Nathan Scott. Located at 3rd Avenue and Quebec Street downtown Prince George. Moran’s follow-up Judgement at Stoney Creek is a provocative study of the inquest into the hit-and-run death of Coreen Thomas, a young Carrier women in her ninth month of pregnancy, in 1976. She was walking home from a dance in Vanderhoof following a racist shouting match around 2 a.m. She was struck by a vehicle driven by 21-year-old Richard Redekop. Medical personnel did not attempt to save the term baby. Both the driver and the victim had been drinking. Redekop’s younger brother Stanley had struck and killed Coreen Thomas’ cousin Larry Thomas in a pick-up truck two years earlier. “The way in which the powers-that-be handled Coreen’s death haunted me in 1976 and it haunts me now,” said Bridget Moran, when the book was published. While attending the inquest into the death of Coreen Thomas, Bridget Moran met Mary John in 1976. 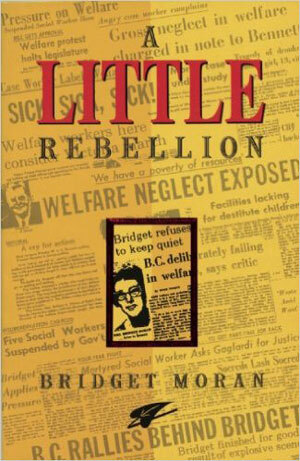 Having challenged the social welfare system in the 1960s, Moran reviewed that system over a 40-year period in an autobiographical work called A Little Rebellion. It was followed by Justa: The Life of a Tribal Chief (Arsenal Pulp, 1994), a biography of Justa Monk. After stabbing and killing his brother during a drunken blackout in 1967, Monk slowly rebuilt his life as tribal chief of the Carrier Sekani Nation. Justa Monk was Chief of the Carrier-Sekani Tribal Council from 1981-1983 and again from 1990-1994. He became Executive Director of Tl’azt’en Nation, Co-Chair of the Northwest Tribal Association and a member of the Task Group of the First Nations Summit. Her final book, Prince George Remembered, is based on interviews she conducted in Prince George. Married to Pat Moran in 1955, she had four children, one of whom, Mayo Moran, became Dean of the Faculty of Law at the University of Toronto. Bridget Moran received the Governor-General’s Medal commemorating Canada’s 125th anniversary, the Jean Clark History award and honourary law degrees from UNBC (1995) and the University of Victoria (1996). She also served on the boards of Prince George’s College of New Caledonia, the Legal Services Society of B.C. and the Yinka Dene Language Institute. Bridget Moran with Mary John. Bridget Moran died on August 21, 1999. The concluding hymn at her memorial service was Solidarity Forever. When a statue of her mother was erected in 2004, her daughter Roseanne said, “She always said that love is an action word. It’s no good just to talk about it. You have to get out there and get involved with things.” An annual Bridget Moran Advancement of Social Work in Northern Communities Award honours an individual in northern British Columbia who has contributed to the advancement of social work ideals. Completed in 1998, NHS’s first low income housing project in Vancouver at 380 Main Street was named after five-term Vancouver City Councilor Bruce Eriksen, now providing 35 apartments at 100% occupancy. The Bridget Moran building, at 668 Powell Street, provides 61 low-income apartments at 100% occupancy, operated by the Neighborhood Housing Society. Stoney Creek Woman: The Story of Mary John (Pulp Press, 1988; 16th printing Arsenal 2014). Justa: The Life of a Tribal Chief (Arsenal Pulp 1994). Prince George Remembered (Self-published 1996). In 1932, anthropologist Diamond Jenness published a comprehensive work, The Indians of Canada, in which he examined the Carrier tribe in central British Columbia. “…the Carrier do not understand the complex civilization that has broken like a cataract over their heads, and they can neither ride the current nor escape it. The white settlers around them treat them with contempt and begrudge them even the narrow lands the government has set aside for them. Several generations later, the indominatibility of the Carrier people has not gone unnoticed. 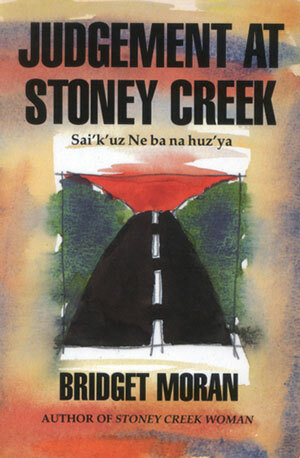 Bridget Moran’s Stoney Creek Woman: The Story of Mary John (Tillicum/Pulp $9.95) is a memoir that also chronicles the Carrier tribe from the time of the arrival of missionaries and settlers in the Bulkley Valley to the present. At the core of the book is the inspirational story of Mary John of the Stoney Creek Reserve, a dignified survivor of racism and innumerable tragedies. Now 76 years old, John became Vanderhoof’s Citizen of the Year in 1979. “Over the years, between 1930, when I was 17, and 1949, when I was 36, I had 12 children, six girls and six boys. Some were born in the village, some on the’ trapline or at our hunting grounds. “Not one of my children was born in a hospital. My mother acted as a midwife for me; when I lost her, my aunts or other relatives were with me. “Some of the midwives practised the old ways of Native medicine. We call it the laying on of hands. We believe that some Native women have a gift of healing in their hands. ..
Mary John’s story has been transferred into prose by Prince George’s Bridget Moran, a social worker and Native advocate who first visited Stoney Creek Indian Reservation in 1954. Born in 1923 in Northern Ireland, Moran made headlines in 1972 when she was evicted from the visitors’ gallery in the Victoria legislature in 1972 for staging an anti-poverty protest. Moran and Mary John met in 1976 at the time of an inquest into the death of another Stoney Creek woman, Coreen Thomas. Mary John acknowledges the hardheartedness of nuns and priests who controlled native residential schools, and she believes the Canadian government and the church have destroyed her people’s language and culture. Nonetheless she remains a devout Catholic. Now into its third printing, Stoney Creek Woman received the Lieutenant Governor’s Medal for Historical Writing from the B.C. Historical Federation in May. In January Moran was also the recipient of the Jeanne Clarke Memorial Award for local history. Today there are approximately 540 Stoney Creek Indians, compared to 166 in 1929.